So we had a supermoon. I first went out on Saturday evening to catch the (almost) supermoon moonrise. We had really clear skies that day and there was a chance that Sunday evening would be cloudy. The first spot I wanted to shoot from was unavailable due to a giant boat show. My planned shot was ruined. With 15 minutes before moonrise, I hoofed it with my gear 2/3 of mile in flip-flops to a possible second location. I got there and was set up in 13 minutes. Walking that fast in flip-flops is not recommended. Saturday’s moonrise was about a half hour before sunset, which was awesome. There were some low clouds on the horizon that blocked the view of the moon sitting on the horizon line, but whatever. It worked out pretty good. On Sunday evening, I headed out to the same spot. It was a little cloudy, but not too bad. 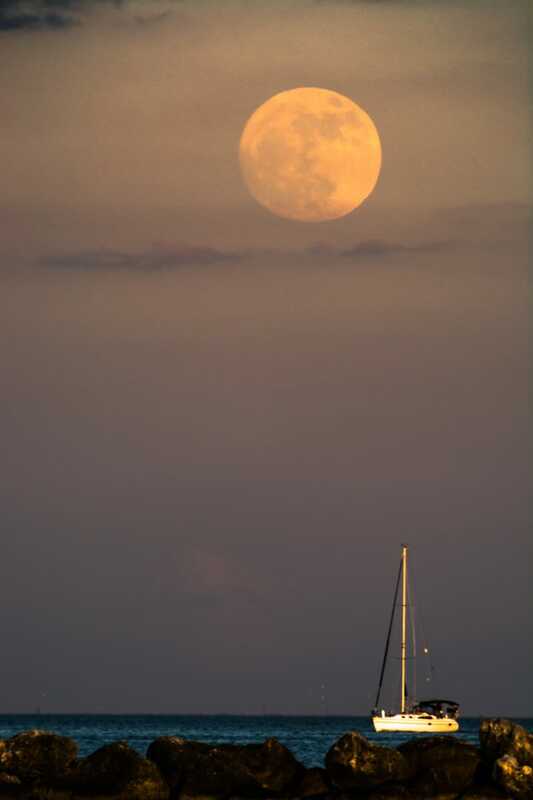 Moonrise for the supermoon would come about a half hour after sunset. That kinda sucked. I was really hoping it would have been just a little lighter out, but no luck. I was on the east side of downtown St. Petersburg and any remaining light radiating from the western horizon was blocked. I did my best and came away with two shots that I’m pretty happy with. The next two full moons are also supermoons (January 1st and 31st), so I’ll have a chance to try again. If my original spot is available for one of those, I’ll be happy. It has some semi-lit moored boats to use as a great foreground. Anyways... here are Sunday’s supermoon pics. Funny story. I was just happy to get a boat going by in front of the moon. This boat kept tacking back and forth exactly where I wanted it. I wasn’t trying to get the mast lined up on the edge of the moon. I wasn’t even looking at that. I was watching the boat itself trying to get a good silhouette in the moonlight. I probably couldn’t get the mast to line up like that if I tried, but yet I got it twice! Crazy.